The EMB 145H Erieye AEW&C is a modern advanced longe-range radar Aircraft (mini-AWACS) developed by the Swedish company Ericsson. AEW&C means Airborne Early Warning & Control. There have been manufactured 4 Aircraft for the Greece Air Force. 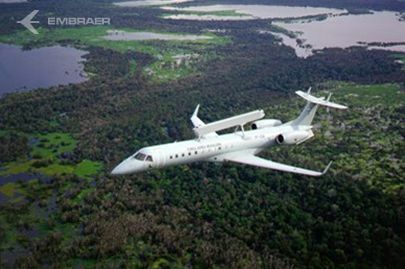 The aircraft is from the civil aircraft company Embraer in Brazil, head contractor is Ericsson in Sweden, the electronics are from Thales in France and the electronic warfare systems are from Elettronica in Italy. The aircraft have been manufactured in Brazil, then they were flown to Sweden to add the Electronics, radar and test flight. (2 Aircraft were first flown from Brazil to Greece and then from Greece to Sweden). The electronics are from Thales-elektronica in France. The aircraft has NATO-classified systems like: crypto-equipment for the radio's, Link 11, Link 14, Link 16 data links. Greece will use the 4 aircraft for surveillance missions above the sea near Turkey against terrorist threats.